We all have periods of time when we feel less energetic and struggle to find motivation. It is common to feel this way on occasion but, when these moments start becoming more frequent or last for longer periods of time, we might start seeing ourselves differently. Our goals become less important, we find it difficult to feel inspired and we might start wondering if we are capable. We may even start calling ourselves lazy. We all have a sense of who we want to be, how we want to behave, goals we want to accomplish, and how we want to show up in the world. Ideal self is a concept in psychology that refers to the image we carry in our minds of what our best self would look, act, and feel like. Our ideal self is often an image of productivity and our achievement of certain goals, healthy behaviors, and more. Unfortunately, our busy lives don't often allow for much reflection on our ideal self and it seems to get lost in the shuffle, tucked away somewhere with our childhood answers to "What do you want to be when you grow up?" If you feel lazy or unproductive at times, you are certainly not alone. Research has found that only 8 percent of people who set a New Year's resolution actually achieve their intended goal. In fact, 1 in 4 people don't make it past their first week before throwing in the towel! What happens that makes it so difficult to hang in there, stay productive, and work toward our desired goals? There are many things that can get in the way of our productivity and achievement of goals, leaving us to see ourselves as "lazy." Sometimes the obstacles are situational or related to timing and opportunity, while other times we may be creating the obstacles ourselves with our approach, our mindset, or our methods. In order to make real progress and quit our old "lazy" patterns, we need to recognize what might be influencing our inability to reach our goals or leaving us feeling less productive than we would like to be. 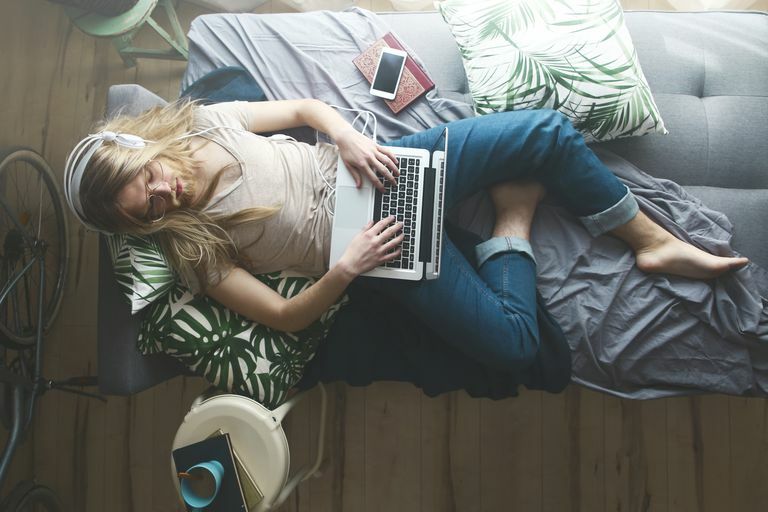 So, what you might think of as "lazy," may just be a matter of switching up your approach and getting rid of old, unhelpful habits that have kept you from feeling productive and achieving your goals. Making your goals too big or complicated. We all want to reach the pinnacle, but we might grossly underestimate how much effort and time it takes to get up there. If we give up after a few hours, it's not because we are lazy but because we may have realized we miscalculated the amount of time and effort involved. Expecting yourself to be perfect. When we are working toward a goal we expect the road to be smooth and consistent when, in reality, the path toward our goal is most likely going to be full of twists, turns, and setbacks. Listening to your inner critic. If the term "lazy" is part of your self-talk, there are likely more negative and critical statements that come from your inner critic on a regular basis. You may even bring out your inner critic in an attempt to motivate yourself. What happens? Your critical voice focuses on all of your flaws and shortcomings, rather than any existing strengths and positive attributes that could help you move forward. Listening to criticism from others. As we learn about ourselves and the world through our experiences, we are receiving feedback from others that helps to shape our self-concept. When someone important to us has called us lazy in the past, it can really impact how we see ourselves even into adulthood. We may also hear people criticize our efforts in our adult life, leaving us to feel self-doubt or discouragement. Not creating a plan of action. When we find inspiration and become excited about a new goal, we can forget the importance of creating a plan. Our excitement for the goal can cause us to move fast and with a lot of passion, but turn into a sense of being overwhelmed and feeling aimless. Create small, attainable goals. You can still desire to reach the pinnacle, but break that huge goal down in to smaller goals that will help you feel more accomplished and motivated to continue climbing. As you consider the big picture, remember the key steps that will be needed to get there and write them down. If needed, break those down into even smaller or shorter-term goals. Take time to develop a plan. Sit with yourself for a moment as you reflect on your desires and goals, considering those small and attainable steps you will need to accomplish in order to get there. Be realistic about the amount of effort, time, money, help or other factors involved in meeting this goal. Going into the process with an action plan will help you feel more confident and peaceful, as well as give you something to refer back to when you feel discouraged or have a setback. Focus on your strengths. If you are used to an inner critic that focuses on your flaws and shortcomings, you will find great benefit in taking inventory of your strengths. Do you find it hard to think of any personal strengths? Consider any challenge you have been through and reflect on what personal strengths you used to get through that experience. If you still find it difficult to identify strengths, ask friends or family what they see as your greatest strength. You can also find strengths assessments online, such as the Values In Action inventory. Celebrate the small victories. Celebrating your victories as you accomplish the small goals, or even as you overcome setbacks, can help you continue moving forward. The pride we experience in meeting our goals can help reinforce more positive self-talk. We experience increased self-efficacy with each accomplishment, which can help us find long-term success. Recruit support. It is okay to ask for help along the way. We thrive when connected to important people in a positive, healthy way. Allow those important support people to be a part of your experience. You may want them to celebrate with you along the way or may want to turn to them in times of need when you experience a setback or obstacle. Finding reassurance and encouragement from important people in our lives can help us develop greater resiliency. Our feelings of laziness can also be influenced by how we are taking care of ourselves physically. We can learn new goal setting habits and work to challenge our negative thought patterns, but we also need to consider what we are doing for our bodies. Taking care of our physical health can help set the stage for increased energy which, in turn, can allow us to put these other positive changes into action. What we eat plays a significant role in how energetic we feel. When our schedules don't allow much time for food planning and preparation, we might find ourselves reaching for quick options on the go, options that offer little nutritional value to help us maintain adequate energy levels. Foods higher in protein, for example, can help our bodies to maintain more stable blood sugar levels and keep us from feeling drastic ups and downs in our energy through the day. Although sugary foods can give us a temporary boost of energy, it is very short-lived and can leave us feeling as if our energy levels have bottomed out. The timing of our meals and snacks can impact our energy levels as well. Eating smaller meals through the day can help us maintain steady levels of energy, compared to eating larger, heavier meals that often leave us feeling tired. When we are tired and feeling lazy, the last thing we likely want to do is exercise. However, moving our bodies can help increase our energy levels and overall feelings of productivity. Research has shown that even just low to moderate levels of exercise can have a significant impact on our energy levels, helping to reduce fatigue. Our sleep patterns can greatly impact our energy levels. If you tend to feel lazy, you might think you are getting too much sleep at night or find yourself taking extended naps during the day. Creating a healthy sleep routine can help you maintain a consistent sleep schedule and, in turn, help you feel more balanced and energized to take on tasks and feel more productive. If you are a night owl or a napper, this transition could take some work. However, being able to start your day with increased energy, and being able to maintain your energy levels through the day, make the sleep routine worthwhile. Being constantly over scheduled, with demands placed on us in multiple areas of our lives, can leave us feeling physically and emotionally drained. In these moments we can find it difficult to take active steps and make decisions because we are exhausted. Feelings of exhaustion can leave us feeling as if we are lazy when we are actually stressed and overwhelmed. A significant element of stress management is making sure we are using our time wisely. It can be easy to say "yes" to our co-workers, our spouse, our children and friends. So easy, in fact, that you may find yourself unable to actually fulfill all of what you have committed to. Look at where you are spending your time, take inventory of unfinished tasks on your to-do list, consider where you can politely say "no" so that you can use that time for things that need your attention and energy. If the idea of setting boundaries is new to you, the first couple of steps would include giving yourself permission to do it and to start with small things. You may be afraid of how people will respond to you and that is okay. Remember that your goal here is to improve self-care, increase energy and feel empowered to tackle the tasks and goals that are important to you. Creating time for yourself is key and setting small boundaries around your time will help you do just that. Lastly, when we feel lazy it is natural to look around and think everyone else is getting it right except you. Don't allow yourself to get caught in the distraction of comparing yourself to others. Remember, our inner critic is a roadblock to our productivity and can keep us feeling stuck. Allow yourself to show up differently in your life and remember that the journey is uniquely yours. Taking small steps toward better self-care, increased energy, improved goals and healthy boundary setting can help you stop feeling lazy in no time. Prioritizing and taking consistent action steps are the key to long term change and there is no better time than now to take those first steps.